Despite some information given by Poll. IX 83, the general economy of Pherecrates’ Krapataloi remains unclear. Aside from the difficulties (the fragments are often quoted by ancient sources without any other information regarding the text), some fragments (i.e. Fr. 85, 86, 87 and 89 Kassel - Austin) seem to be related to the katabasis or during the journey through the Underworld, where the poet locates a ‘‘land of plenty’’. References cited in some verses may indicate important clues useful for a plausible reconstruction of the context. Machon’s plays, staged in Ptolemaic Alexandria, seem to have employed the stock plots and characters of New Comedy. A few of their elements, however, are hardly typical of that genre. The mageiros in fr. 2 introduces himself as a lover of good food, intent on tasting his own dishes. This trait is not attested in cooks of extant Middle and New Comedy, but recalls figures of the earlier comic tradition: the Megarian Maison; some cooking personages in Epicharmus’ Sirens; the gourmand Cyclops of Cratinus’ Odysseˆs; Aristophanic protagonists preparing food for their own enjoyment; and the greedy Heracles of the Birds. The philological study of earlier comic texts flourished in Alexandria during that period, and Machon also seems to have been a scholar. His familiarity with older comic forms perhaps inspired him to borrow ideas from them and combine those borrowings with the standard materials of his contemporary comedy for innovative purposes. Dioscorides’ funerary epigram for Machon implies similar practices, stating that this poet revived the pungent spirit of ancient comic art. Beside the scholarly work on Homer and different versions of the Phaenomena’s proem (see «Aevum», 88, 2014, 59-97), ancient sources speak of astronomical and medical treatises composed by Aratus. These scientific texts did not survive, with the only exception of Fr. 95, 87 Supplementum Hellenisticum. The attribution of the medical treatises to Aratus is here upheld, against the opinion of Bernd Effe and Fridolf Kudlien. The island of Samothrace lies in the northern Aegean Sea, opposite the mouth of the river Evros. After being colonised by the inhabitants of the island of Samos in the 8th century BC, the isle hosted a famous sanctuary dedicated to the mystery cult of the Cabeiri, who were generally invoked as ‘‘Great Gods’’. To the Great Gods was devoted Arsinoe II since she became the wife of the king of Thrace, who was himself a protector of the sanctuary; the site was also revered by Ptolemy II, brother and last husband of Arsinoe II. The text sets out to review the archaeological, literary and epigraphic documentation that allows us to frame the sanctuary of Samothrace within the political and institutional dynamics of the early Hellenism. In two passages of book XIV Diodorus emphasizes the recognized hegemony exercised by Sparta both on land and sea after the Peloponnesian War (XIV 10 and 13). We have to put these places side to side with others: XIV 84 and 97, XV 23, XV, 60, XV 78-79, from which a judgment of failure of the maritime hegemony as such comes out: it takes its full value only if it is combined with hegemony on earth. Unlike Xenophon, who still believed in the dual hegemony and in the division of spheres of influence between Sparta and Athens, Diodorus reflects a perspective which is not Athenian and which reopens the debate on the conditions for the exercise of Panhellenic hegemony. Diodorus probably draws this topic from an historiographical tradition interested in Boeotian hegemony. According to Plutarch, Andronicus of Rhodes (1st century B.C.) drew up Pinakes of the works of Aristotle and Theophrastus on the basis of books from their personal library which had been hidden away in Skepsis, centuries later brought to Rome by Sulla, where finally copies made by Tyrannio came into the hands of Andronicus. Andronicus’ Pinakes are lost. Our sources only provide scant information about them. Interestingly they are mentioned in a treatise on Aristotle written by a certain Ptolemy, the Greek original of which is also lost, but which is preserved in several Arabic sources. Most importantly, this treatise contains a catalogue of Aristotle’s writings, and additionally in one source manuscript (Ayasofya 4833) Ptolemy’s introduction to his treatise in which he explains its content and structure. 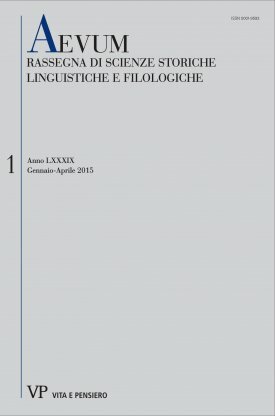 Ptolemy’s Aristotelian Pinax is one of the three extant ancient lists of Aristotle’s writings, its structure and titels closely resembling Aristotle’s corpus as it is currently known. Because Ptolemy mentions Andronicus’ Pinakes in his list, the general assumption was and still is that Ptolemy more or less copied his list from Andronicus, and that therefore Andronicus’ lost work on Aristotle can be reconstructed directly from Ptolemy. However, Ptolemy’s introduction – contained only in Ayasofya 4833 – (which, although discovered around the middle of the last century, still is rarely taken into account) clearly excludes this hypothesis, as in it Ptolemy informs us about fundamental differences between Andronicus’ approach and his own. Currently there are three widely diverging translations of this introduction which – specifically in four passages – have important consequences concerning the relationship between Ptolemy and Andronicus. This article aims to offer a new interpretation of the relevant passages on the basis of a translation from a new transcript of the Arabic original text by E. Wakelnig. All the Sergii of the early Republic are presented by our sources in an unfavourable light: the first of them was a member of the infamous second college of Decemvirs; the following often quarrelled with their colleagues and were defeated in battle; when they were victorious, the Roman people paradoxically mourned for the fallen instead of cheering the victor; the only remarkable woman was protagonist of a conspiracy, aiming to poison the primores civitatis. On the other hand, the great-grandfather of Catiline, a hero of the Second Punic War, is barely mentioned by Livy. Even the mythical founder of the gens Sergia, as depicted by Vergil, seems to remind of Catiline’s bad temper. The events of 63 BC must have contributed to fixing the unfavourable picture of this gens, which was bound to ill-fated events of early Roman history. More than fifty further emendations to the newly discovered Galenus’ text, edited by Veronique Boudon-Millot and Jacques Jouanna, with the assistance of Antoine Pietrobelli, Galien. Ne pas se chagriner, Paris, Les Belles Lettres, 2010 (Collection des Universite´s de France, Galien, IV).